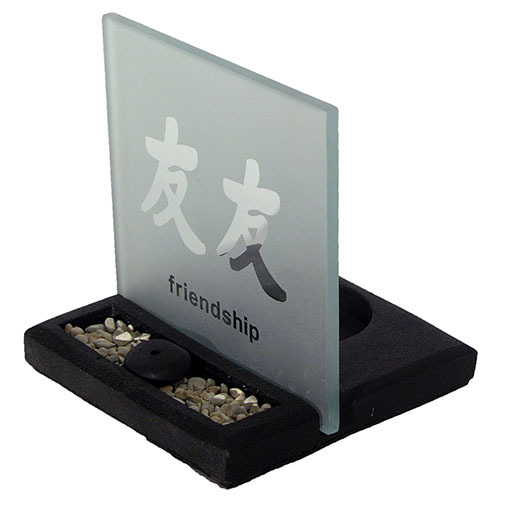 Elegant Zen garden T-Light and incense holder with frosted glass screen decorated feng shui symbol, simple gravel display and sturdy heavy resin base. This neat little gift set can help to create a wonderful tranquil mood, when a candle is lit, the light projects through the frosted glass plate to create delicate patterns on the wall. 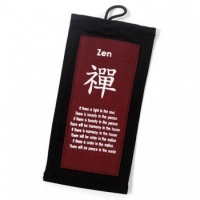 Presented in a gift box displaying the symbol and text it contains; the frosted glass plate, the resin base, a small pack of gravel and a simple 'pebble' stick incense holder. The base has a large foam pad to prevent scratching polished surfaces and further smaller pad to help secure the glass plate into the base. 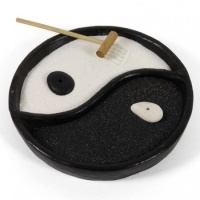 Sorry T-Lights and stick incense are not included.